Jeffrey D. Rothstein, M.D., Ph.D. is the John W. Griffin Director for the Brain Science Institute (BSi), as well as a Professor of Neurology and Neuroscience, and the Founding Director of the Robert Packard Center for ALS Research at Johns Hopkins University School of Medicine. Dr. Rothstein studies ALS pathophysiology, basic and disease related astrocyte/oligodendroglial biology and therapy discovery. It was his research on ALS pathogenesis that lead to the first successful, FDA-approved drug to alter neurodegeneration in ALS. 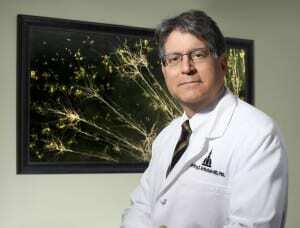 In addition to running an ALS clinic at Johns Hopkins which evaluates and manages over 350 ALS patients every year, he also directs the Brain Science Institute, dedicated to bridging basic and clinical neuroscience including a large drug discovery drug discovery group to identify novel therapeutics for neurological and psychiatric disease. In 2000 Dr. Rothstein organized the Robert Packard Center for ALS Research at Johns Hopkins and serves as Director. This is the first multi-Institutional, Multi-National collaborative academic organization devoted toward understanding the cause of ALS and translating the information into new drug and cell based therapies.